Fall in New England is usually busy, often beautiful and sometimes dangerous, but it’s certainly never boring. 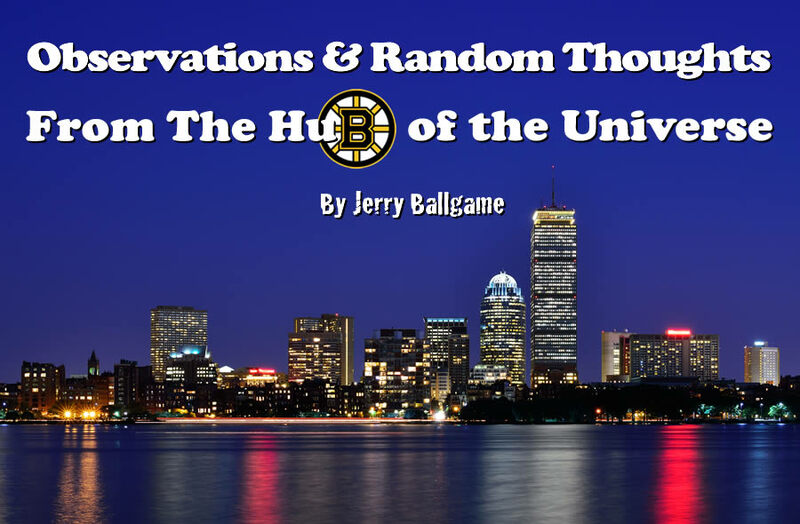 As I write this, we are waiting for the Red Sox to start post season play, the Pats are wondering how quickly Tom Brady will get back into form and the Celtics and Bruins are starting to prepare for their new seasons. We are watching all this while keeping an eye on the possible track of hurricane Matthew. It may not be the Perfect Storm, but it sure feels like it. So, while it’s calm allow me to comment on the above. After winning 11 in a row, and essentially sealing the deal in the AL East, the Sox proceeded to lose 5 of their last 6, including one of the strangest title clinching games I have ever witnessed. It seemed the emotional drain of the David Ortiz farewell tour finally got to them. Big Papi himself admitted that he felt exhausted by it all and bothered by the fact that he was unable to use his usual routine to prepare for the games. That could explain why in his last 6 games he batted a mere .150 with just 3 hits (including 0 for New York), 1HR and 1RBI. He wasn’t alone, as Hanley Ramirez hit .077 in his last 5 games, as well as Mookie Betts at .250. In addition, closer Craig Kimbrel suddenly developed “mechanical” problems that have made him somewhat less than dependable. Not what you want to hear going into the post season. Despite this all, I am optimistic that they can get past Cleveland and make it into the next round. Boston has been a good traveling team all season, and manager John Farrell has finally seen the wisdom of moving the 22-4 Rick Porcello into the opening role, with David Price going second. That should hopefully help get them get one more step closer to a return to the World Series, and an interesting duel with the Chicago Cubs. Like the Sox, the Pats closed off what was essentially a very positive chapter in a very unsatisfying manner. Getting shutout at home, in a game that saw them make a great many uncharacteristic mistakes in all three phases of the game, was about as flat an ending to the whole four game suspension as Roger Goodell could have hoped for. What was particularly strange about it all in my mind, was how quickly Jimmy Garoppolo‘s future seemed to have fallen into uncertainty. When he was tearing up the Miami Dolphins, the speculation was starting that maybe at 24 years old he is the Patriots future, and Tom Brady was only a “system” quarterback, easily replaceable. One bad landing later, and Garoppolo’s toughness is being questioned, and the only question around Brady is how quickly he can shake off the rust. The belief is that it will be very quickly, and that the Browns will not offer much of a challenge. Let’s hope so. Also, while we’re at it, get we get Brady a bigger towel? At this point in the year, especially with the Sox still playing, it is very easy to overlook both the Bruins and the Celtics. Of the two, though, I would say that much is expected of the latter despite the fact that they did not land free agent Kevin Durant. It seems that the signing of the 6’10” Al Horford from Atlanta is being met in a very positive manner, as it is felt that he will fit in well with returning veterans, including guard Isaiah Thomas, forward Jae Crowder, as well as guard, and defensive specialist, Avery Bradley. Will the the Brad Stevens-coached team have enough to threaten the hold that Cleveland has on the East? That obviously remains to be seen, but they certainly should be an entertaining team. As for the Bruins, it seems the biggest news concerning them was their signing of winger, and overall spark plug, Brad Marchand to an 8 year extension. This is no small deal as the B’s have developed a reputation of a late of fussing over contracts for too long, and then losing people they should keep. Marchand joins a list of familiar names this season including captain Zdeno Chara (9/28/37), Tuukka Rask (2.56) in the net, forward Patrice Bergeron (37/36/68), Torey Krug on defense, and the oft injured forward David Krejci (17/46/63), as well as coach Claude Julien (.621 winning percentage). It seems that over the past two seasons, that the B’s have played just well enough to be in contention for a playoff spots without actually making it. I can’t believe that management will put up with a third.